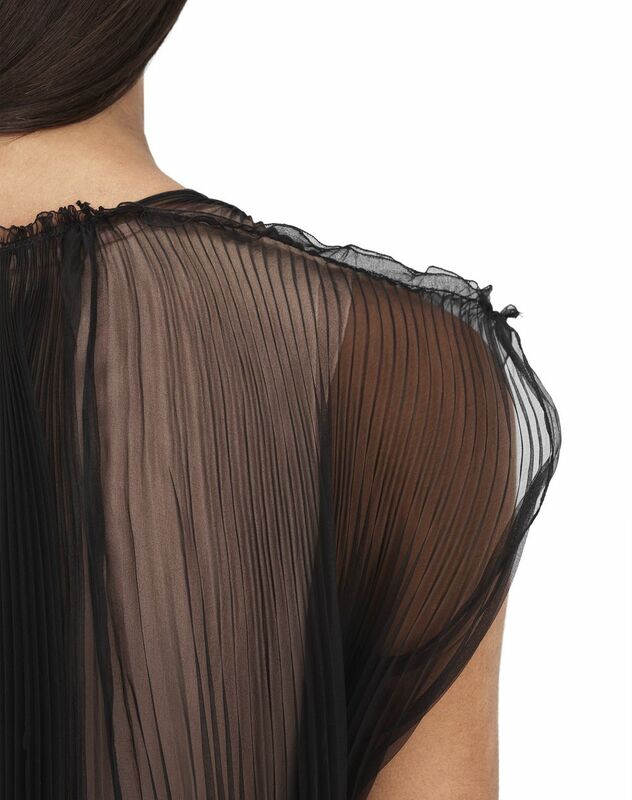 Long pleated dress in black silk organza, V-neck, and beige under-dress. This long polyester weave dress makes a statement with the exceptional craftsmanship of the pleats and the delicate cut. The contrasting pleats add texture and movement to this unique evening dress. A key piece from the Winter 2018 show, it stands out as an evening must-have and adds both a delicate and modern touch to the silhouette. This piece was unveiled in look 01 of the women’s Winter 2018 show. Main material: 100% polyester weave. Secondary material: 100% silk weave. Length: 51.2” Model’s measurements: Height: 5’ 10” Chest: 33.5” Waist: 23.6” Hips: 35” Model wears a size 4.